Haggis was a Celtic Rock band from Cornwall, Ontario, Canada that was active between 1997 and 2001. Haggis performed all over Ontario, Quebec and ventured into the United States. This should have been written long time ago. Sorry for the delay. and, obviously, all the bands that have shared their music. If I have forgotten somebody, sorry for the omission. I guess that there are more people to thank, but these are the ones who have written a comment, sent an e-mail, answered to my requests, have signed-in or written about the blog. 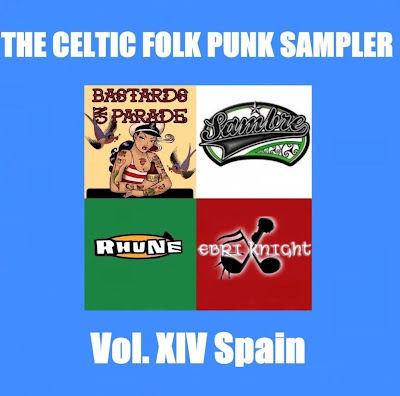 This sampler includes four Spanish bands from different regions in the North half of the country. Two of them come from Celtic regions (Galicia and Asturias) and the others from the Basque and Catalonian regions. Bastards on Parade are a bagpipes-punk band from Galicia. Some of you are familiar with this band. Their EPs have been reviewed at Celtic-Rock.de, they have had some airplay at Paddy Rock Radio and they were also mentioned at the Shite'n'Onions message board when the 2008 Top 10 Celtic CDs were discussed. Till now they have released a couple of EPs and have played with bands such as The Mahones, The Dreadnoughts and Circle J. If you like DKM, Rancid and the Real McKenzies, you will enjoy Bastards on Parade. Sambre are from Asturias. They have included a couple of tracks in some compilations and will release their debut album soon. They are six members, including the piper. 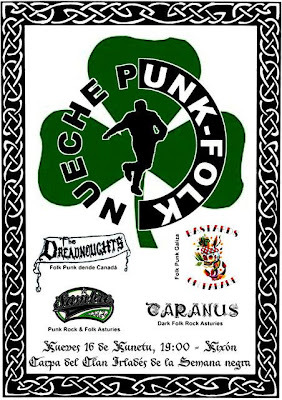 And they have recently played in a Celtic punk festival with The Dreadnoughts and Bastards on Parade. Ebri Knight are a seven piece band from Catalonia. The band has released demos till now. All the tracks from the first demo are included in this sampler. You can find more Spanish bands in previous posts (Konsumo Respeto, Cercavins, Triquel) and in the following weeks I will post some more. The Newcranes were an Ukranian influenced folk punk band from Derby that released some EPs in the early 90's. Their first recording, "Frontline", was released in 1992 and was produced by Philip Tennant, the same guy that produced the Levellers debut "A Weapon Called the World". Their third EP, "Crown of Thorns", was produced by the Vibrators original bassist Pat Collier, who has also produced The Men They Couldn't Hang "Never Born to Follow" and Oysterband "The Shouting End of Life". On YouTube you can hear all the tracks from "Frontline"
It seems that after some delays, The Popes "Outlaw Heaven" has been finally released. 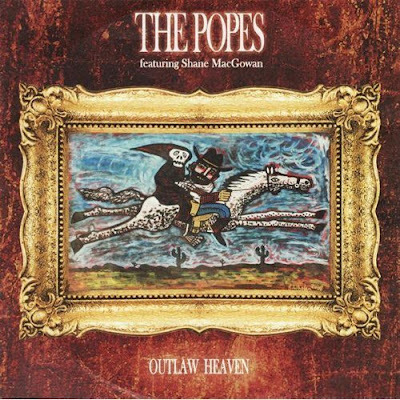 "‘Special Guests’ with Paul (Mad Dog) McGuinness, on the title track ‘Outlaw Heaven’ are no less than his old friends Shane MacGowan and Spider Stacy. Shane also features with Paul on ‘Black is the Colour’ and ‘Don’t let the Bastards grind you down’, PLUS a special solo performance by Shane MacGowan on ‘The Loneliness of a Long Distance Drinker’." 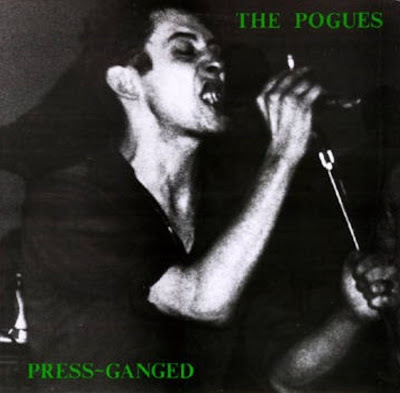 This is an old Pogues Bootleg from 1984. Enjoy! Vol. XIII includes 5 bands from Norway. It is a "difficult" sampler, as many people know the great Norwegian band Greenland Whale Fishers and they could expect to find something as good as them. Obviously, that is not so easy. The first band is a folk-punk band, Belfast Muslims. They come from a town called Halden and are six members. Normally they play well-known songs/tunes and I wish that in their next album they would include some self-penned songs. All their albums can be bought from their website. Just click on "Butikk"
The next band is from Bergen, Shenanigans, a folk-rock band. They are a five piece outfit that apparently has only released an EP. The third band is Belfast Lads, they are fronted by a guy from Northern Ireland and the fiddler/flutist is from Romania. 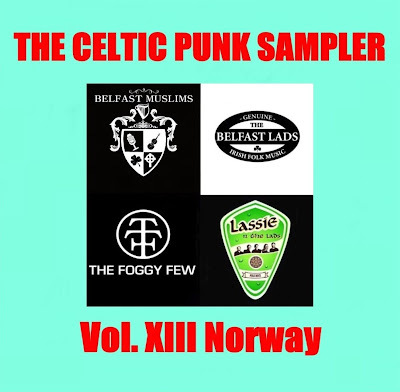 The last band is from a place called Stjordal, Lassie'n the Lads (yes, you're right, many Belfast and many Lads). It is a folk-rock band and has five members. The album can be bought from different Norwegian on-line stores: Cdon.com, musikkonline.no or Platekompaniet. Click on Kjop Storyteller na!